Glasgow Prestwick Airport has narrowed its annual losses, helped by a strong rise in military aircraft refuelling activity. 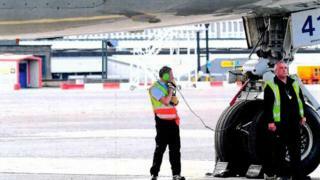 The airport made a loss of £8.6m in the year to March - down from £9.2m the previous year. Total revenue rose by 18% to £13.6m, according to newly-published accounts. The company set up by the Scottish government to run the airport - TS Prestwick Holdco Ltd - has built up a debt of more than £30m. Ministers bought the airport for just £1 from owners Infratil in late 2013 amid fears it could close. A strategic plan has since been put in place with a view to returning the airport to private ownership. In its annual results statement, TS Prestwick Holdco said the group had seen "positive increases in almost all income streams" during the year, in particular from fuelling aircraft. Military activities at Prestwick were boosted by a contract in October 2016 with the US Defense Logistics Agency. TS Prestwick Holdco said: "The group is specifically targeting new military business as a key component of its future development activities. "The ongoing trend for closures of military airfields across Europe is pushing more and more of this business into those commercial airports approved to handle military aircraft." The company also said it had invested in remote immigration facilities to allow "the speedy clearance" of international VIP visitors, from military or business/private jets. Meanwhile, aircraft movements increased by 8.2% to nearly 26,000, while passenger numbers rose year-on-year by 8% to 678,886. However, the company warned that there was still "a significant challenge in returning the group to a sustainable and profitable operation". Andrew Miller, chairman at Glasgow Prestwick Airport, said the year had seen "progress and visible upturns" across the business. He added: "Our objective, in line with our strategic plan, is to return the airport to private ownership. "While we believe this is achievable, there is still a significant amount of work to do before the airport is in a position of profitability. "We will continue to work closely with the Scottish government, as well as local and national partners, to ensure Glasgow Prestwick Airport makes a positive contribution to the economy."